On June 6, 1944, the Unterstrumführer Exner of the SS-Panzergrenadierregiment 25 1st Battalion belonging to the SS Panzer-Division Hitlerjugend, reconnoiteres Hottot-les-Bagues and Tilly-sur-Seulles with his platoon, Installs in the area for the night. On 8 June the Panzer-Lehr-Pionier-Battalion 130 and elements of the Panzer Lehr-Abteilung 130 of the Panzer Lehr Division reinforced the position, repulsing the opposing patrols. On June 10th, the 1st Battalion of the Panzer Lehr Regiment 901 attacked Tilly in the direction of Saint-Pierre and succeeded in seizing the village, repelling the English from the 8th Battalion Durham and Nottinghamshire (Sherwood Rangers) Yeomanry. On June 11, the British sought to break through the front line by launching a new offensive in the direction of Juigny-sur-Seulles starting at 5.30 pm: the 56th brigade of the 49th Infantry Division encountered strong German defenses at the entrance of the village, and could not enter it. From 19 to 26 June, the Tilly-Juvigny sector was liberated and lost 23 times by the British. When the front stabilizes and the British are definitely masters of the place, carcasses of tanks haunt the ruins of houses completely destroyed. From June 27, 1944, Hottot-les-Bagues served as a starting point for the 146th brigade of the 49th Infantry Division to conduct new operations to the south. Today, 965 British soldiers, 132 Germans, 34 Canadians, 3 Australians, 2 New Zealanders and 1 South African are buried in the Hottot-les-Bagues military cemetery. 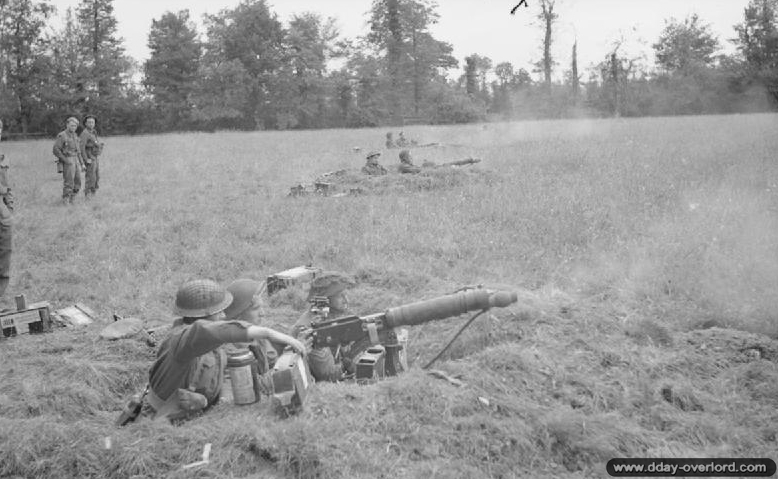 July 11, 1944: Vickers machine guns from the 2nd Battalion, Cheshire Regiment, providing fire support during an attack of the 231st Brigade of the 50th Northumbrian Division north of the village of Hottot-les-Bagues. Photo: IWM. 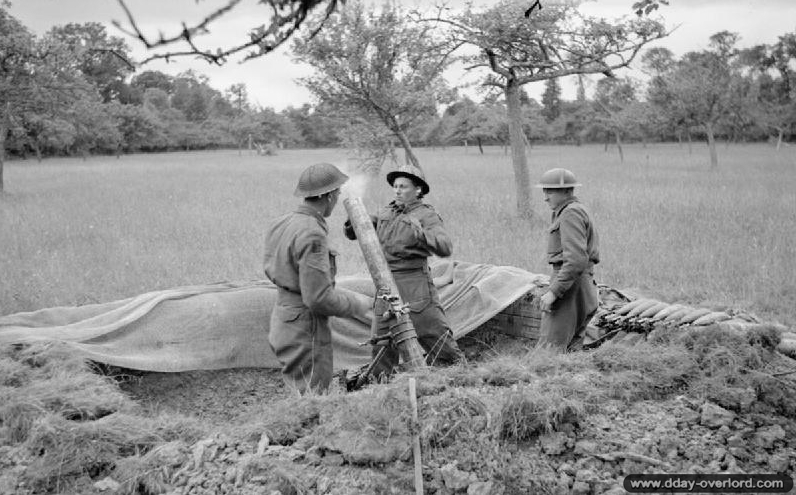 July 11, 1944: a 4,2-inch English mortar belonging to the 2nd Battalion, Cheshire Regiment, providing fire support during an attack of the 231st Brigade of the 50th Northumbrian Division north of the village of Hottot-les-Bagues. Photo: IWM.